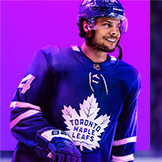 EA SPORTS UFC - Why Bruce? 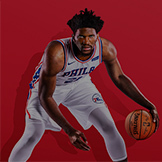 Posted April 8th at 12:00am. 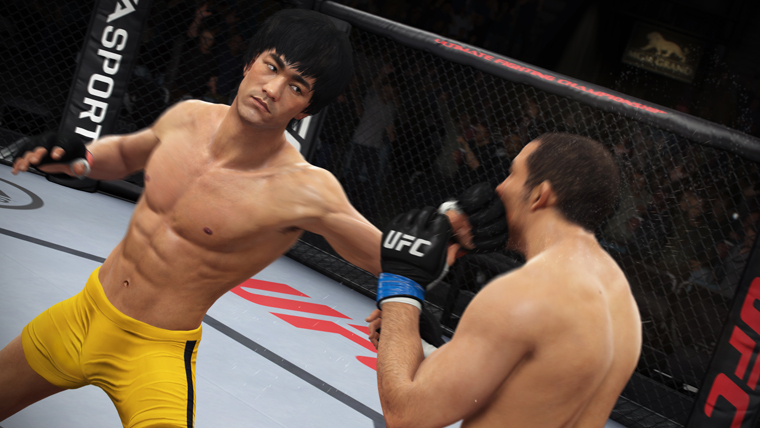 Creative Director, Brian Hayes, and Art Director Ian Lloyd discuss the reasoning, challenges and personal significance behind bringing martial arts legend Bruce Lee to life in the digital world of EA SPORTS UFC. You have the premier organization in the fastest growing sport in the world, the UFC; and the most iconic martial artist in the history of the world, Bruce Lee – a martial artist renowned for his philosophies that laid the groundwork for modern mixed martial arts. I can’t conceive of a universe where bringing these two things together doesn’t make sense. I know there are going to be countless fans that feel the exact same way and they will be eager play with such a legend in the UFC Octagon. I am one of them. 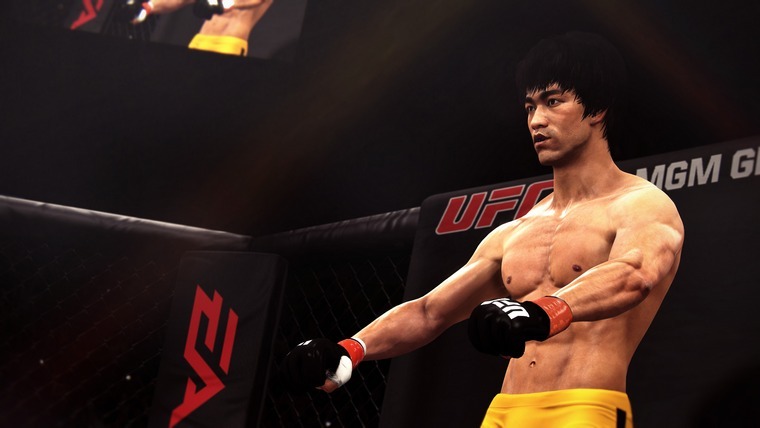 When we first heard that there was a possibility of adding Bruce Lee to the roster for EA SPORTS UFC everyone was excited at the prospect and more than a little nervous. 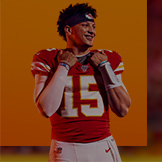 Nobody wants to tackle a legendary icon like this and mess it up. We had done a pretty exceptional job on our UFC roster to that point, with the majority having been scanned expressly for the game. A handful of fighters were being built in the ‘traditional way’ - using whatever reference we could get our hands on. Bruce would have to be built the same way. There were many eager artists who wanted the chance to tackle this once-in-a-lifetime opportunity but Stephen Chan was our man to realize Bruce Lee. He had built several UFC fighters from scratch and relished the challenge. We were quickly connected to Bruce Lee Enterprises who provided us with not only an impressive catalog of digital references spanning Bruce’s acting career, but many behind-the-scenes and candid shots that helped us identify the specific era we wanted to capture as well as the iconic elements of his face and body. A real bonus was the life-cast they sent us that gave us a truly definitive three-dimensional reference that would prove to be the next best thing to having Bruce scanned. There are many challenges associated with trying capture the likeness of anyone who has attained an iconic status on a global scale. Just look at any wax museum. Sometimes a figure is easily recognizable while others seem to be so enigmatic and elusive. Bruce Lee is one such enigma. 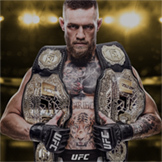 For our purposes we had developed a sophisticated character system for UFC that emphasized the dynamic anatomy of MMA fighters in a variety of fighting contexts – striking, getting struck, grappling, moving around the ring and the cumulative effects of enduring three to five rounds of intense combat. When one thinks of Bruce Lee’s body what comes to mind is not a person, in the traditional sense, but rather a ‘super-human’ expression of coiled power, control and flexibility. Ridiculously shredded, broad cobra-hood back, tiny waist. Every muscle contracted, ready to spring into lethal action. We had to find a balance between a passive and active anatomy that focused on ensuring a powerful iconic read while still delivering a dynamic range of muscle flex. It is easy to overdo it in the base, limit the dynamic range and kill the illusion. Seeing Bruce Lee walkout and enter the Octagon to fight in the UFC for the first time is a surreal and truly sensational experience. It is hard to deny the influence he has had on the development of MMA and ultimately the UFC. 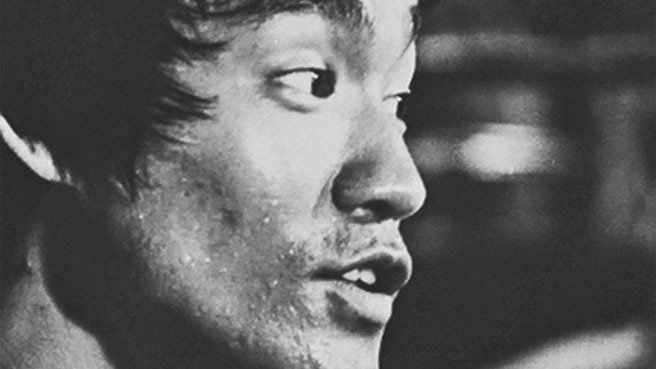 This does not just look like Bruce Lee. It is Bruce Lee. The way he carries himself, his fighting stance, his rippling physique, devastating speed, signature strikes and accompanying yells, whoops and shrieks. We have summoned this pinnacle of human strength, speed and spirit into our world and it has truly been an honor and a career highlight for us to do so. 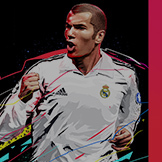 Pre order EA SPORTS UFC here. Like us on Facebook and Follow us on Twitter to stay in the conversation on all things EA SPORTS UFC.